At the USENIX Symposium on Networked Systems Design and Implementation (NSDI) this week in Boston, Mass., a team of researchers accepted an award for the most influential paper among those presented a decade ago at the annual conference. 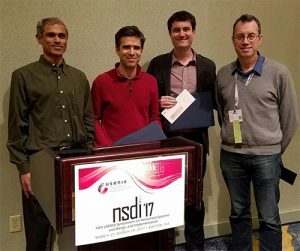 The 2017 NSDI Test of Time Award was presented during a luncheon on March 26 to two former graduate students at UC Berkeley who co-authored the paper published at NSDI 2007, along with their three UC Berkeley advisors. George Porter, and UC Berkeley’s Ion Stoica. Modern Internet systems often combine different applications, span different administrative domains, and function in the context of network mechanisms (tunnels, VPNs, overlays and so on). In their 2007 paper, the co-authors argued that “diagnosing these complex systems is a daunting challenge.” “Many diagnostic tools existed at the time, but none existed for reconstructing a comprehensive view of service behavior,” said Brown’s Fonseca. 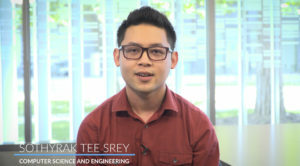 The researchers implemented X-Trace in protocols and software systems, and in their prize-winning paper, they set out to explain three different use scenarios: domain name system (DNS) resolution; a three-tiered photo-hosting website; and a service accessed through an overlay network. 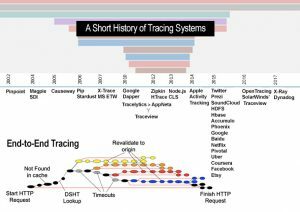 History of tracing systems and echoes from X-Trace and Google Dapper approaches to end-to-end tracing. 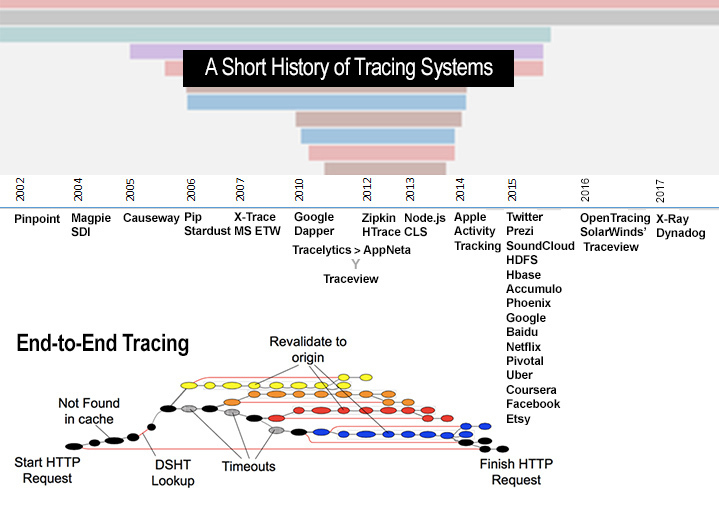 The rapid adoption of tracing began with Google’s introduction of Dapper in 2010 (see graphic), which offered a similar primitive to X-Trace. Twitter’s Zipkin and Cloudera’s HTrace were open-source implementations of Dapper. Another current competitor in the market, called Traceview, also has X-Trace in its DNA after a series of startups and acquisitions dating back to 2010. Porter also received an NSF CAREER Award (in 2016) for work on a scalable multiplane data center network. He plans to demonstrate a hybrid electrical-optical network topology that will scale to hundreds of thousands of servers – at link rates reaching 1.6 terabits per second. Meanwhile, the excitement surrounding tracing continues unabated. In 2017, for example, Amazon has released X-Ray, which offers distributed tracing for Amazon Web Services, and another company, Datadog, also released an end-to-end tracing product earlier this year. *Rodrigo Fonseca, George Porter, Randy H. Katz, Scott Shenker, Ion Stoica, “X-Trace: A Pervasive Network Tracing Framework , Proc. 4thUSENIX Conference on Networked Systems Design and Implementation (NSDI), April 2007, Cambridge, MA.